During the past week I created a 2011 version of the book. It can be downloaded from the Buchanan and Watson page of my website. 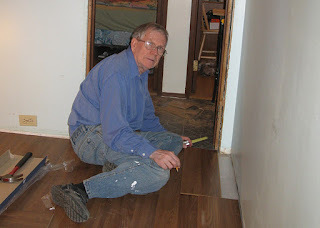 Two weeks ago we replaced the last carpeting on the main floor of our house. This was in the master bedroom, which doesn't get a lot of traffic. We hope that the laminate will help Judy's athsma, as it doesn't trap dust as the carpeting does. Here is photo of me, as the job draws to a close. The 12" chop saw I borrowed from Andrew really simplified cutting the laminate and the new baseboards. Sometimes a single document can change the order of things! My Goldring line in Rogate, Sussex, England seemed well documented. The birth of Elizabeth was in the Rogate parish register, showing her father was John Goldring. Likewise her marriage to my ancestor, William Walder/Waller is in the Rogate marriage register. The baptismal register shows four children of William Walder over the next few years, including my ancestor William, Who married Elizabeth Mills. No other birth or marriage of an Elizabeth Goldring is shown in the Rogate parish registers during the appropriate time period, so it seemed very straight-forward. "One important fact is that daughter Elizabeth married Richard Cobb in Haslemere, Surrey. Many trees I have seen have that quite wrong!" Later my correspondent sent me the Will of John Goldring, which includes "Seventhly I give and bequeath unto my daughter Elizabeth Cobb the sum of fifty pounds to be paid within six months of my decease." I looked for the marriage of Elizabeth Goldring and Richard Cobb, and I found it on FamilySearch.org. My Elizabeth Goldring was married to William Walder and they were having children in Rogate parish at this time. Hmm ... obviously we have two different Elizabeth Goldrings. When and where was MY Elizabeth Goldring born, and who are her parents? I cannot find her in any of the currently digitized records, but the search will continue. I believe she was born near Rogate, otherwise it is unlikely that she would have been married in Rogate parish. Yesterday Judy and I visited Mom and her sister. They were in good spirits. They always enjoy a visit. Using my laptop I was able to show them all of the recent family photos, which they enjoyed. On December 6 and 8 at 7 PM at 14325-53 Ave, in Edmonton we have scheduled a lesson on Genealogy on the Mac. A friend who has MacFamilyTree has agreed to teach the lesson on one (possibly both) of the nights. This is last of the series of lessons at Edmonton Riverbend Family History Center until after Christmas. If you use a Mac for genealogy, I invite you to come. I have chosen to answer the phones from 8 AM - 5 PM on Mondays and Fridays (MST). So if you call for help during that time period there is a chance that I might be the person answering the phone. I am answering 15-20 calls on most days. It keeps me on my toes.